Published on June 16, 2017 June 15, 2017 by cara.b.b. 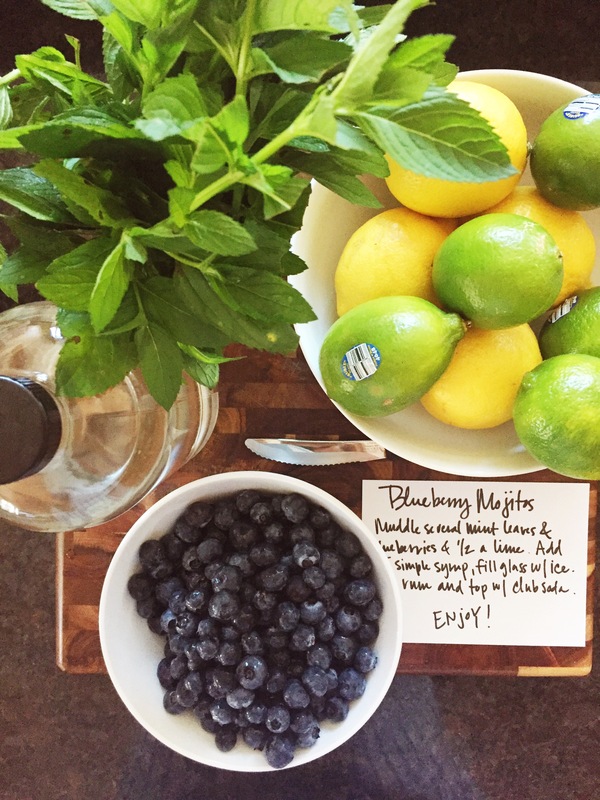 if you follow me in instagram, you know we enjoyed some blueberry mojitos this past weekend. they were light and refreshing, and not too strong, which honestly, is my favorite combo. i just can’t deal with a headache the next day, which is often what happens if i have more than one drink. #lightweight problems. jared jokes that i’m like goldilocks – i have to be hydrated and fed just the right amount or i am not a happy gal….and while it pains me to admit it, he’s right. you couldn’t see the entire recipe on my post, and i got a few questions about it, so thought i’d share the whole thing and a few other favorite summertime drinks with you here! muddle 8 – 10 mint leaves and 6 – 8 blueberries in a glass. squeeze the juice of 1/4 of a lime into glass and throw in the piece of lime. add two tablespoons of simple syrup (<—- some fun ideas for infusing it too!). now fill glass with ice, then add one shot of light rum (i think vodka would work too), and top off with club soda. as simple as it sounds. one can of the prickly pear san pell and one shot of vodka over crushed ice. this is one of my very favorite cocktails, and i love it any time of year! fill glass with crushed ice, squeeze 1/4 of a lime over ice and drop in. add one shot of vodka, and fill glass with ginger beer (i love trader joe’s version). extra points for the copper mug! also, any of these are great if you leave out the booze! bottoms up!